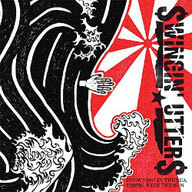 For thirty years, few bands have relished getting their hands dirty as much as the Swingin’ Utters. Formed in 1988, the early lineup was comprised of Johnny Bonnel, guitarist Darius Koski, bassist Kevin Wickersham, and drummer Greg McEntee. In celebration of the band’s three decades, as well as their continued forward momentum, on December 8, Fat Wreck Chords is proud to announce Drowning In The Sea, Rising With The Sun, a 33-song best-of compilation that serves as a testament to Utters’ peerless punk rock attack. But Bonnel’s not one to get reflective. “I’m not the kind of person who plays my own records—that’s kinda weird,” he says. Yet, when he listened through Drowning In The Sea, Rising With The Sun, what he found was a collection of songs that are emblematic of his band’s history. There are live staples, fan favorites, and even few tracks that never worked their way into the band’s sets. “Some of the songs we never played live. It was cool to look back on those,” says Bonnel. Touching on every era of the Swingin’ Utters—from their 1995 debut album The Streets of San Francisco, all the way up to 2014’s Fistful of Hollow—this collection is a testament to a band that never tried to fit into anyone else’s box. While there are plenty of gut-level punk songs, there are tracks that incorporate roots music and folk traditions, all of which speaks to the band’s blue-collar ethos. “I’m most proud of that, the longevity” says Bonnel, stating that he’s grateful for what the band’s built, and he hopes to keep pushing the boundaries as the band continues on. That kind of life-affirming energy is what is captured throughout Drowning In The Sea, Rising With The Sun, and is evinced by the material found therein. 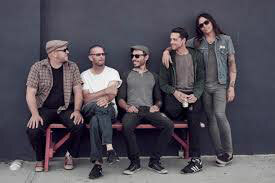 While the Swingin’ Utters were never ones to stagnate, their embrace of new members throughout their career allowed them to be a multifaceted beast, taking their West Coast punk signature and being open to incorporating anything else that caught their fancy. “Having these other established musicians coming in with fresh blood, that keeps things super energetic and exciting,” says Bonnel. The Swingin’ Utters passion for what they do has always been palpable, and it’s why Drowning In The Sea, Rising With The Sun is as crucial now as when the music was first released. For fans, it’s a celebration of one of the Bay Area’s longest standing creative forces. And for the uninitiated, it offers a cohesive rundown on a band that’s impossible to sum up.